Awhhh , back to school! Parents love this time of year! While the summers are great to spend time together and venture out on holiday’s, it can also turn your child’s sleep routine into non-existent. This may seem fine at the time but you may notice your child’s behavior change when they have to get back into the daily grind of a school schedule. Some children take a change of routine with little to no fuss, while other children it can change their whole behavior and sleep habits. Lets talk about why sleep is so important to your child. they might not be. Some parents say my child is FULL of energy in the evening before bed, there is no way they will go to sleep earlier.. While that may seem true the truth is your child may be OVER tired at this point, and very hyper or giddy. You may find that they don’t go to sleep well and play around for a long time when in bed, or wake up multiple times at night. Starting an earlier bed time routine could solve this problem allowing them to get the sleep they need. 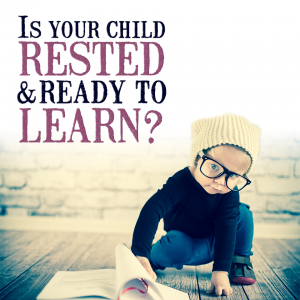 Children that are overtired may have problems focusing in school causing learning issues and a frustrated child. They may present them selves as having symptoms of ADHD or ADD due to being ‘hyper’ and unable to focus. Sleep is so important to children for developmental and health reasons. A child that lacks sleep can wreak havoc on their ability to fight off viruses during cold and flu season. ← Adults Need Sleep Too!